Python is currently one of the more popular programming languages in use and by all appearances will continue to be so. Academic assignment help – Python programming problems assigned as homework may be quickly solved using our Visual Basic programming help service. An explanation of programming solutions can be provided free of charge. 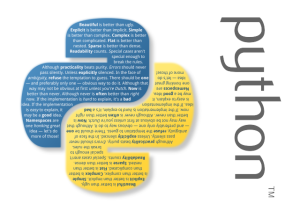 Python programming projects – Our programming staff is available to help you with programming projects ranging from the most simple to the most complex. Personal tutoring – We offer personalized tutoring services that are customized to fit your specific needs. Tutoring is available at a time that suits your schedule. Your programming level and experience are taken into consideration when we design a tutoring program for you. Should you have difficulty with a particular concept or idea, our tutors will review with you until you thoroughly grasp the principles involved. Regardless of the type of Python programming help you need, we are more than capable of meeting your requirements. When you need programming help, contact us and let our computer programming experts put their skills to work for you!